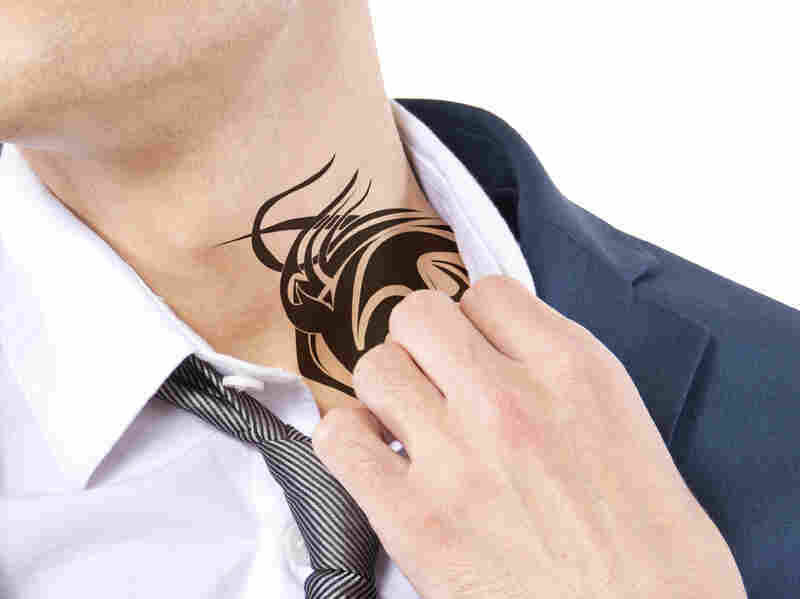 Job Seekers Still Have To Hide Tattoos (From The Neck Up) Twenty percent of adults and nearly 40 percent of young people have at least one tattoo, but most keep them covered. Despite increased popularity and acceptance, employers just don't want to see them. Deanna Mullennax spent six months last year looking for a job. Having tattoos, she says, definitely didn't help. "Tattoos literally change your career," says Mullennax, who is now working at a bakery in Chicago. "They call them 'job stoppers' for a reason." Tattoos have become more common over the past couple of decades. A Harris poll in 2012 found that 1 out of every 5 adults — 21 percent — has at least one tattoo. An earlier Pew Research Center study found that the number was closer to 40 percent among those ages 18 to 29. But they are far from universally accepted. Pew found that the vast majority of people with tattoos keep them covered. "There is a social stigma," says Jenson Whitaker, who works in the oil industry in Amarillo, Texas. "People assume you're ignorant or thuggish." Whitaker wears depictions of two mythological beasts across his chest, while his belly is covered with his family crest. But his co-workers don't know these drawings exist because his company requires that employees wear long-sleeve shirts. "In this day and age, you have to have the ability to cover them," he says. "People with tattoos are definitely discriminated against." TrueArtists, an association of certified tattoo artists, asked on its Facebook page whether people agreed with the statement, "Never get a tattoo where a judge can see it." The way the question was phrased seemed to answer itself, but opinions were decidedly mixed (and often expletive-laden). "It was a topic that brought out a lot of passion in our community," says Paulie O'Mahony, community manager for TrueArtists. Chelsea Booker says she knew she was fine getting tattoos because she works in the restaurant industry, where they're fairly well-accepted. "I got tattoos after I decided this is what I'm going to do all my life," she says. You can see some of them when she wears a scoop-neck shirt, but Booker describes her own tats as "artful" and "tasteful." She's totally put off, though, when she sees tattoos emblazoned on someone's neck or face. "I have tattoos, and I discriminate against people with tattoos," says Booker, the catering manager for an Italian restaurant in St. Louis. "I see people come in with stars on their face — why would you do that?" Multiple reality shows, including Best Ink, Bad Ink and Ink Master, along with heavily tattooed athletes and celebrities, have served to make tattoos more popular. There may still be regional variance in terms of acceptability, however, suggests Mariano Diaz, CEO of 2Kool 2B True, a tattoo-themed clothing design company based in Miami. "On the West Coast, the tattoo lifestyle is extremely strong, and it's supernormal," Diaz says. "On the East Coast, it's strong. Probably the central states are more like an issue." But face tattoos can still shock people anywhere, he says. "For a normal person it's like, 'What the hell is that person doing?' Good luck finding a job, say, working in an office." Workplace policies prohibiting tattoos have triggered regular rounds of lawsuits in recent years. According to guidance from the Society for Human Resource Management, when it comes to "body modification" such as tattoos and piercings, employers must provide "a reasonable accommodation for religious practices." But employers are within their rights to prohibit tattoos with profane or demeaning images or slogans, according to SHRM. The Army's more restrictive tattoo policy received considerable attention last September when it was announced, triggering a rush among soldiers to get ink before it took effect. But the rules — barring tattoos below the elbow and knees or above the neckline, while others would have to be "self-identified" to unit leaders — haven't taken effect and are "still pending review," says an Army spokeswoman. Booker, the catering manager, says some people are still put off by her designs. "People look at me, like, 'You've got tattoos and you're going to plan my rehearsal dinner?' " she says. She can understand their reaction. Booker admits she wouldn't be comfortable if she went to see a doctor who entered the examining room wearing a nose ring. Perhaps for that reason, most of the major hospitals and health systems in the St. Louis area, as elsewhere, have dress codes that mostly prohibit visible tattoos. St. Louis University Hospital, for example, requires employees to "cover and conceal" tattoos and other body art that's offensive or "may be frightening to children." But last year, Children's Hospital in St. Louis updated its dress code, allowing tattoos to go uncovered and giving managers discretion in terms of addressing designs that could be considered offensive or unprofessional. "We know that tattoos and piercing represent an important mode of self-expression, and we don't want to stifle that, as long as they're not considered offensive," says Jackie Ferman, a spokeswoman for Children's. "I'm sure it's a relief for a lot of people."